I live in California, and I get FRESH greens all year long. My Dandilions only cost me $1.39 for a big bunch. I can get large bunches of Collard Greens for about $.55 each. My only problem is that I know they're not organically grown. But seriously... I've been thinking of going into business with an Iguana Garden. 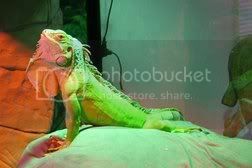 So I thought of starting an Organic Iguana Garden and selling online. I would grow all the "staple" greens, and overnight them where ever. What do you guys think? I've got to research shipping produce across state lines, but I really think I could provide a much higher quality product than we get at the grocery store. And we won't have to worry about what the pesticide residues are doing to our precious babies. Honestly, I think it's a wonderful idea, but I'm afraid most people wouldn't be concerned enough with them being organic to pay extra. Maybe you could start small and expand as you saw saw increase in demand. Would there be any need for city business licensure or insurance? Your prices on Dandilion Greens sound about the same as here (once you convert to canadian) I have been looking into shipping of greens as well ...It seems it can get a little sticky when you want to ship plants of any kind across the border into or out of the U.S. I think it's an excellent idea! You'll need FDA licensing to ship across state lines, but the product is pretty harmless, especially organically grown. Please let me know what you find out. I think I may do some digging, on your behalf, in my tiny, tiny amount of spare time. I'm so glad to know that there's interest. As far as charging more for organics, I don't think that would be necessary. But SHIPPING costs do scare me. That might make it cost prohibitive for buyers. I'm pretty concerned about the effects of pesticide residues on the long term health of our iguanas. Hubby and I will be moving in the Spring, so I'll have plenty of time to research all of this. But I will let you all know how it's going and if it's feasible. Funny you should mention that. I watched an Oprah one day, ok......waiting for you to stop laughing......come on.......that's enough now.......I WAS AT A FRIEND'S HOUSE!..........it's not like I run in at 4pm everyday to turn it on! Geez! Well, anyway, I was watching a show that had a couple on who mistakenly, and for their own use, invented Salad in the Bag! They hold the patent and are grossing multi-tens-of-millions of dollars a year!! All because, A) The had a need to fill for themselves, they were actually lettuce farmers and had no time to prepare and eat salad themselves. Ironic as that sounds. And B) The product hit a niche they weren't even aware of, first through restaurant and food-service distribution channels, then directly to us happy consumers. So Neeeaaaawwwww. Yes, I do know that some folks got rich selling vegetables. Also, after thinking about your idea, and talking to my favorite nay-sayers, I realized. It's all marketing! You can just find a reputable Organic Produce Supplier with an e-business and market their product in your name. Hey, they don't care who you sell it to and how, just as long as they make their money. Then, as your wealth slowly builds, you can purchase your own farm, say Martha Stewart's house on Long Island. It'll be up for sale eventually. You could actually raise your own veggies, and have plenty of room to rescue Iguanas, the part I'll run of course! LOL And all we'll need to do is get rid of the darn multi-colored, egg-laying chickens!!! Is that just brilliant or what!?! 1. I DO NOT believe that you don't run into the house at 4:00 to watch Oprah. 2. So I was WRONG about anyone getting rich off selling veggies. 3. You'll have to move to California because I'll be buying ?? (Arnold's, Lacy Peterson's, [insert name of famous person here]) house! Oh yea... and I like chickens! Actually the most wonderful part of this is that my hubby didn't shoot down the idea! He's actually started thinking about acreage we can use! You go, Steph! Sounds wonderful! I'll be a customer for Willem and myself. Good Luck! Winter is coming and i m very worried about Spyro s fresh food.I can get dandelion green (which he hate) endivia,ruccola,chinese gabage,carrot,red pepper,green beans and frozen mix.Can we survive until spring come? And one more thing...Which food you should cook and which you sholdn t.
He'll be fine until spring. Not many greens tho eh? How about sweet potatoes? They are very high in calcium. I don't know what others do, but I don't cook any of Thrasher's food. I chop it into very small pieces so she can get it into her mouth easily. You are saying,that you dont cook green beans? I put all her veggies in a food processor and chop them so they are about the size of rice. She eats about 1/2 a cup of veggies per day + 2 large plates of greens. I don't cook any of Gil's food either. I bought a "Salad Shooter" and I run all of his veggies through it with a medium shredder blade. It's great for parsnips, squashes, sweet potatoes, green beans, carrots... anything that pretty solid. It doesn't work for greens though, they just turn to mush.